I know I usually give loads and loads of details about all my empties each month, but since I am away at the moment and my jetlag still doesn't seem to have gotten better, July's post is going to be a little shorter than usual. Don't worry though, you will still get all the usual information including sizes, star products, and what I wasn't so keen on after all! July was a slower month for products I found, as my skin wasn't wanting quite as much. I had to go for lighter formulas, plus I was trying to use up some goodies that had been in my cupboards for a bit too long. Most of my items last month were full size (11), and I only had two sachets and two deluxe samples -- plus I finally finished up another face oil which is always exciting since they last ages!! In total, I used up 15 products, and all the packing was recyclable except the sample sachet packets. RawGanic (Aloe Vera) (25 wipes x2): I have said it before and I will say it again -- I adore RawGanic's facial wipes. 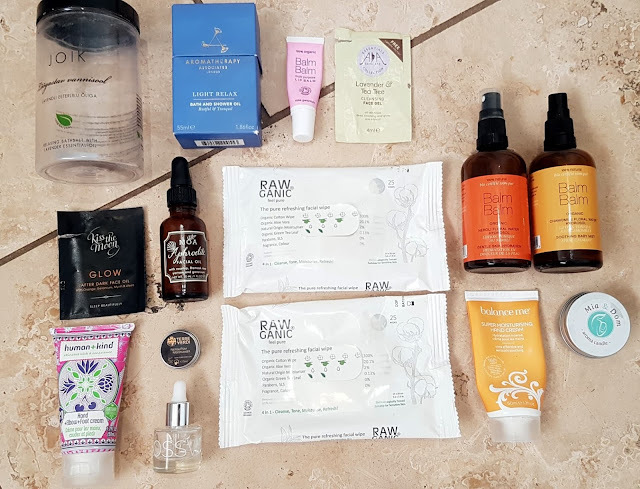 I have got several packs in subscription boxes (Pip Box, The Natural Beauty Box, The Cruelty Free Beauty Box) as well as purchased on my own, and I have used at least 5 of these since discovering the brand. They are perfect for travel, on the go, or those times when you just don't have the energy for a full in depth skincare routine. The material is plastic free and is made from 100% cotton, and the formula is super gentle and effective. Will continue to use, and highly recommend! Balance Me Super Moisturising Hand Cream (50ml): Heads up -- this isn't vegan. I know many of Balance Me products are vegan, so I was kind of surprised when I found out this one wasn't. That being said, I didn't love this product. The cream left my hands feeling a little congested since the formula is so thick and heavy, plus the sheer amount of fragrance in it is offputting. It has an almost chemical smell compared to other natural products, and is so in your face it leaves you wishing you had just skipped the treatment altogether. I ended up having to use this on my legs instead, where at least I could mask the scent by putting leggings on after the cream finally sank in. Will be skipping this in the future, and would not recommend (though BM does have some lovely items in their range!). Balm Balm Neroli Hydrosol (100ml): Very sad this is gone, as it is such a lovely floral water. The smell is uplifting and perfect for a calming pick me up just like their rosewater (I mean, did you see my wellbeing post?? ), plus I love that these come in glass bottles. The nozzles are still plastic, but it is much better than some of the other floral waters I've tried in the past which are totally plastic. And luckily these full sizes from Balm Balm are really cheap, so I will be buying another as soon as I can find a stockist (as this variety seems to be gone from LL). Balm Balm Chamomile Water (100ml): Again, love this stuff! Balm Balm makes really great floral waters (well, their Frankincense gets some getting used to, but other than that...) and the chamomile one is perfect for nighttime use. The scent is calming and relaxing, so actually makes a good pillow mist as well as a toner/facial spritz. Plus, the water is great for irritated or itchy skin so is fab for summertime. Can't wait to get another bottle. Mia & Dom Aroma Candle (30ml): I really liked this candle, but I do wish it lasted longer. It gave a few evenings worth of burn time, though I will say we leave them going for quite some time. The smell is lovely and makes the whole room smell of roman chamomile and lavender. Brilliant for unwinding at the end of the day and for de-stressing before bedtime. I have one more of these, but after that one is gone I will have to check and see if I can find another easily. Glossworks Cuticle Oil (9ml): Probably one of the best nail oils I have used so far, and definitely one of the more affordable options out there. The bottle is pretty small, but it lasts absolute ages. I tend to put some on the bed of my nail and rub it in, plus a drop under each nail just so it can soak in and work its magic even more effectively. I already have two more bottles of this that I have bought, so I am well stocked for the foreseeable future! Human & Kind Hand+Elbow+Foot Cream (50ml): I did actually like this cream a lot, so I am not sure why it took me so long to use. I got this months and months ago (I think from The Cruelty Free Beauty Box's October 2017 edit), and even though the tube is pretty small at 50ml, the formula is really rich and nourishing so you don't need to use that much. I mainly applied to my feet, and locked in the moisture with my foot socks, and found this really effective. It helped heal any cracks or sore spots, and kept my heels manageable. I would get another tube in the future possibly, but at the moment I am prioritizing plastic free options so might not get back to this for a long while. Terre Verdi NeroliPom Moisturizer (5ml): I absolutely ADORE this moisturizer, and it actually might be my all-time favourite so far. The formula is lightweight but still so nourishing, and I find it is suitable for my skin year round -- even in the heatwave we have all been having! 100% natural, 81% organic, vegan, cruelty free, Soil Association certified, and jam packed with antioxidant goodness, this moisturizer is most definitely on my keep list. It has a really lightly fruity scent (not overly sweet, not sickly floral -- seriously perfect! ), and sinks into the skin almost immediately. My face is sensitive to changes, but this was so gentle that I didn't suffer from my usual 'I switched products' breakout. Once I have made my way through my collection of creams, this is first on my list to buy a full size of -- and hopefully I can try out more of the range soon too! MOA Aphrodite Facial Oil (30ml): You all know I love MOA, so it probably isn't a huge surprise that I also adore this facial oil. Aphrodite has a light marshmallow and rose scent, and is packed full of nourishing and calming ingredients that can help smooth fine lines, combat early aging, regenerate the skin, help with blemishes and redness, help fight dryness, and even skin tone. My only complaint about this oil is that after a while the rubber stopper started to pop out and I would have to try to fix it back together. The product itself is gorgeous though, so I was okay with this. I hope to get another bottle at some point, but you all know how huge my facial oil collection is! Kiss the Moon GLOW After Dark Face Oil (1ml): This product really suited day or night use thanks to the uplifting aroma and the lack of 'oily' finish. The oil seemed to sink into my skin quickly (probably because it is not necessarily geared towards mature skin), and it felt nourishing without being heavy which is exactly what I look for in face products. I really enjoyed this oil, and I think I will need to invest in a full size at some point. Joik Relaxing Bath Salts (500g): This is a huge container, so the salts lasted me many months which is amazing considering the price. The lavender essential oils that are infused in are dreamy, and make this the perfect late night soak. I love that these are an effective budget option that are still all natural and Ecocert. My only wish is that the packaging was not plastic -- a simple switch to glass would have me buying these whenever I ran out! Aromatherapy Associates Light Relax Bath & Shower Oil (55ml): I have so many AA oils as I went into my 'all of the things' mindset that I sometimes fall into once finding one product I like. I had discovered the tonic and cleanser, both of which I had never used before in my life, and then decided I needed everything they made. The one we just finished is Light Relax, and while there are some things I love about it, I'm also unsure about these oils for two reasons: cruelty free status and hydration quality. While the smell itself is powerful and everything I want from a relaxing bath oil, the hydration my skin got was a little lacking. I found myself still having to put on a body cream afterwards, or adding a small amount of carrier oil to the bath after the fact. For the price tag, this is not something I should have to do. Plus, AA's cruelty free status are currently under question, so this is one brand I won't be buying from again (at least until all is resolved/answered). Balm Balm Rose Geranium Lip Balm (7ml): I grabbed the rose geranium lip balm pot from Balm Balm during the last Love Lula sale, and was just hoping to fix the damage done from a previous balm. What I wasn't expecting was for my lips to be completely healed overnight, and for them to be more hydrated than they previously had been! This stuff is a miracle worker, so I ended up buying the tube for convenience when out and about. I do think I will stick to the pot as the oils in this ended up getting a little separated for some reason, plus I think Balm Balm might be switching their pot to glass packaging soon, and that is so much better than wasteful plastic! AA Skincare Lavender & Tea Tree Cleansing Face Gel (4ml): I liked this a lot, especially the smell which was soothing and a bit antiseptic. I was worried the essential oils would not get on well with my face, but it was really gentle and didn't cause any problems. The gel spreads easily and feels cooling on the skin, and when I rinsed it off my face felt super refreshed and clean. One of the best things about this product? Price -- the full 100ml size is under a tenner! My favourite for July? It's a tough call, but I think I would have to go for MOA's Aphrodite facial oil and of course the gorgeous Terre Verdi NeroliPom moisturizer -- both are seriously next level and were so good for my skin. I will be repurchasing/purchasing full sizes of both in the future as they are just too great to resist for long! As for my 'skip it' items, I would have to say Balance Me's hand cream, and not just because it isn't vegan. The cream was much too fragrant, didn't feel very nice when applied, and just wasn't what I wanted or needed from a product like this. It doesn't help that I have started using Kiss the Moon's award winning hand cream which is like a spa treatment in comparison! Are there any products I finished up that you have been trying or have been eyeing up? I would love to read what your empties were for last month -- let me know in the comments! Interested in trying a number of these products, especially The BalmBalm lip balm and the Terre Verdi moisturiser. BalmBalm is available via 'Only Naturals'plus you get 10% off your first order. Think Naturisimo' may be a stockist too - hope that helps. Thanks for a really interesting and useful posting. Going to seek out the RawGanic wipes for my daughter's skin, she's prone to break outs at the moment and these sound ideal! I love the sound of a lot of these products! I love seeing peoples empty posts - it is always interesting to see what people have used up. I am awful at getting to the bottom of any product. Such a great selection of products! I really don't use many products but I love to hear what's out there. I totally enjoyed reading your empties post last month and again this month, still can't believe that you have used up 15 products this month. I totally love RawGanic and use it myself. I'm trying hard to use up bits and pieces in my drawers at the moment over buying new products though like you my skin has needed less this month.